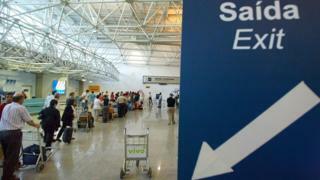 The Brazilian authorities have suspended the issuing of new passports because of a budget crisis. The Federal Police, which usually issue passports within six working days, said it would not accept any new applications made after Tuesday. One of Brazil's prosecutors blamed President Michel Temer's budget cuts. Brazil is suffering its worst recession in decades. The government said emergency funds for passports would be debated this week. In a statement late on Tuesday, the federal police said the decision to stop issuing new passports "stems from a dearth of funds earmarked to the activities of migratory control and the issuance of travel documents". Passport application charges range from 260 reais ($79; £61) for a 10-year passport to 350 reais ($106; £83) for express processing. One of Brazil's top prosecutors, Carlos Lima, accused the government of trying to stifle the police by cutting their funding. Federal police are investigating the involvement of the country's business and political elite in a corruption scheme centred on the state oil company, Petrobras. "Who wins with this? The investigative team has been reduced," Mr Lima said. The announcement comes as President Temer's government tries to rein in spending as part of an effort to address a deep fiscal deficit. Brazil's budget ministry has proposed extra funds to help ease the strain on passport issuance and has urged the Congress, who have to approve the measure, to vote as early as next week. Brazil is currently approaching the winter holiday season - a peak travel period.